The procession of St Fermin takes place on the morning of the 7th July through the streets adjacent to the Cathedral and to the church of San Lorenzo. Over the last thirty years this has become a popular act, with an increasing number of spectators. It is an act in which the principal protagonists of the fiesta all come together. 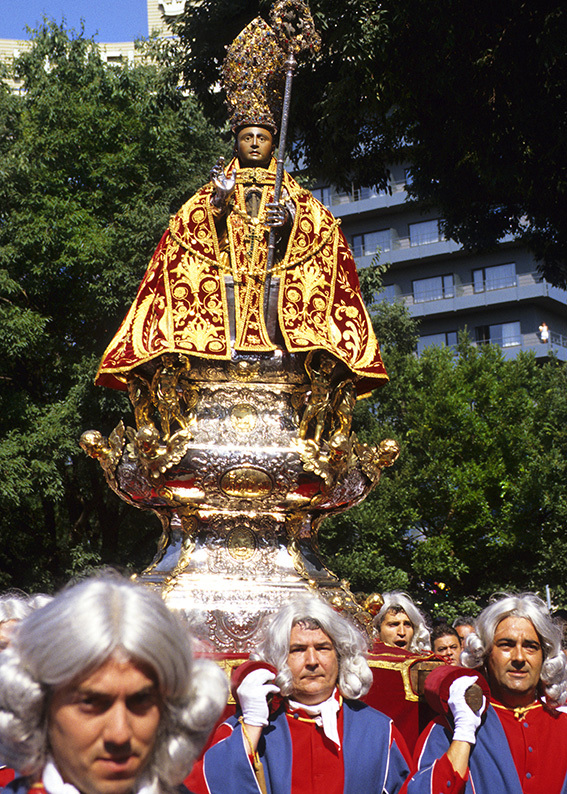 The figure of the Saint is lovingly paraded through the streets accompanied by the macebearers, giants, guilds, Jota singers, regional dancers and the authorities in formal dress, in a procession full of popular enthusiasm. Devotion to St Fermin is exceedingly deep rooted amongst the people from Pamplona, a long-standing sentiment present long before the San Fermin fiestas even came into being. The Saint's presence is evident in each and every one of the acts, such as the song sung by the runners asking for the Saint's protection before the morning bull run, the cries to San Fermin when the rocket marking the start of the fiestas is launched and the sad "Pobre de Mi" (poor old me) at the end of the fiestas. Devotion to the Saint is a tradition transmitted from father to son, through the experiences shared in this all-encompassing fiesta. According to tradition, the Roman senator Firmo and his family were converted to Christianity through the influence of a priest named Honesto, who carried out his evangelical work in 3rd century Roman Pamplona. His son, Fermin, was christened by St Saturnino in what is today known as the well or "pocico de San Cernin". Fermin went on to be ordained bishop of Toulouse, France. Although years later he returned to Pamplona as a bishop, Fermin ended his days in Amiens, where he managed to convert more than 3,000 persons before being imprisoned and finally decapitated on the 25th September one year. Together with St Francisco Javier, San Fermin is the patron saint of Navarre, as well as the patron saint of the diocese of Pamplona and the saint of the guilds of wineskin makers, vintners and bakers. On the day following the Chupinazo, when the rocket is fired to mark the start of the fiestas, the authorities, clergy, representatives of the different guilds and brotherhoods in the city, and churchgoers, all wearing formal dress and traditional suits, form a procession to parade San Fermin through the streets. This is the occasion to get out one's best clothes to attend this religious ceremony, always a white blouse, skirt, trousers, combined with a red sash and kerchief, and with espadrilles with red ties. The councillors exchange their 19th century ruff and cocked hat for tailcoats and top hat, bow tie and white gloves, chain over the waistcoat and a medal with the city's coat of arms. For the women councillors, a dress similar to the traditional attire of the women of the Navarre valleys of the Roncal, Salazar and Aézcoa has been designed, comprising a long pleated black silk skirt, pleated, high-necked cream blouse, with frills, a black, long-sleeved bodice with flowers embroidered around the edges, and a black silk shawl. 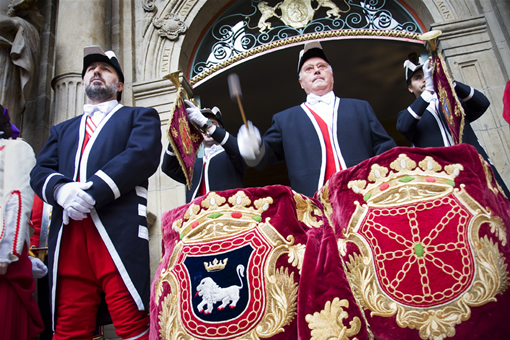 During the morning procession, the solemnity of the act is occasionally interrupted by spontaneous demonstrations of devotion by choirs and bands of street musicians, in addition to the Txistu (Basque flute) and a Jota sung with feeling. For the people from Pamplona, this is an act which cannot be missed and, furthermore, it is a "must see" for visitors in order to discover all the different aspects of the fiestas. Unlike other acts, there are no crowds of people in any one particular place, as it is possible to spread out along the route, so any place is suitable for watching the procession. Although we would of course recommend getting there early enough to get a good place. The procession starts just before ten in the morning, when the Municipal Corporation goes to the Cathedral, escorted by buglers, small drums, macebearers, escorts, Txistu players, Gaiteros (Pipe players), the procession of giants and bigheads, the Pamplonesa municipal band of Pamplona, in addition to the Parish chapters with their crosses, the community of Capuchin monks and the guilds. Once at the Cathedral, the retinue collects the Cathedral Chapter, in a ritual which then takes the procession through the streets of the Navarrería, Mercaderes, Town Hall square, Bolserías and Mayor to the church of San Lorenzo. There a solemn mass is held and the Saint is taken from the chapel to go in procession. San Fermin escorted by an extensive retinue, is then paraded through the streets of the Taconera, Rincón de la Aduana, San Antón, Zapatería, Town Hall square, San Saturnino and Mayor. From there the procession continues along the calle Mayor and San Antón, Town Hall square, calle San Saturnino and back to the calle Mayor, to then return to the church of San Lorenzo where the Saint is placed on his altar. This is followed by a solemn sung mass after which the chapter returns to the Cathedral and the Corporation to the Town Hall, close on two o'clock in the afternoon. Throughout the morning, there are some very moving moments, the most well-known one is the so-called Momentico - little moment. It takes place at the end of the mass at the church of San Lorenzo, when the civil and church authorities are to make their way to the Cathedral, at that very moment the giants dance on the stage accompanied by the piper and Txistu player, in the background María the cathedral bell chimes and the La Pamplonesa band play the "El Asombro de Damasco". Other moving moments are, for example, when the procession passes by the street of San Antón nº 47, and the retinue stops to listen to a Jota sung in honour of St Fermín. In the street of Zapatería, at the plaza del Consejo square, the procession stops and silently listens to the song “Glorioso San Fermín, venimos a cantarte, mayores y chavales…”(Glorious St Fermin, we've come to sing to you, adults and children...) a song which the Santiago choir of la Chantrea has been dedicating to the saint since 1977, as the first “momentico”. Moments later, two children place some roses on the Saint's pedestal on reaching the “pocico de San Cernin” and the Txistu players interpret the Agur jaunak. Twenty minutes before midday in the street Mayor 20 a Jota from Napardi is sung, just before the entrance into the chapel of San Lorenzo. At around 14.45 the regional dancers of the Town Council, finalise the act by dancing in the Town Hall square. The procession retinue is headed by the Procession of Giants and Bigheads, followed by the Cross of San Lorenzo and the Archiepiscopal Cross, then come the historic guilds of carpenters and workers, the Fraternity of the Passion and the Congregation of María, behind are the buglers and drum players, the flag of Pamplona, regional dancers and the municipal Txistu players. The procession then continues with the Carrier and the Image of the Saint, followed by the Cathedral Chapter, Archbishop of Pamplona, macebearers and, ending the retinue, the Municipal Corporation, with the mayor, liveries, Municipal Police and escorts in formal dress. Finally, the municipal band, La Pamplonesa, brings up the rear of the procession. The bust of San Fermin in the procession is a wooden, late 15th century carving, which was plated in silver in 1687. There is a reliquary on his chest, also of silver. The sculpture is seated on a rich silver worked pedestal dating back to 1746. With regard to the origins of this religious act, it is known that the procession in honour of St Fermin was already being held in 1386 given the fact that this was when King Charles II of Navarre recovered the Saint's reliquary from Amiens and placed it in the church of San Lorenzo. However, the worship of the Saint is documented as far back as the 12th century, when Pedro de Artaxona was bishop of Pamplona. In Amiens, the city where St Fermin died a martyr, devotion to the Saint appears in the litanies from the 8th century onwards. As far as the date is concerned, in principle the procession of the Saint took place on the 10th October, to commemorate the date on which he arrived at Amiens. From 1591 onwards, the feast day was transferred to the 7th July to avoid the cold Autumn weather. In this way, the religious festival coincided with the Fairs in the Saint's honour which were held between the day of St Pedro (Peter) and the 18th July.